Many Facebook users would like to customize their fan pages with SWF flash files so as to put banner, header, dynamic photo gallery on their Facebook business pages. How to embed or insert flash file into Facebook fan page? 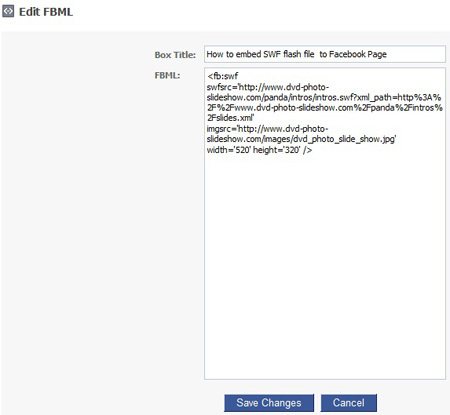 It seems interesting for users who want to put or place flash swf file on their Facebook pages. Part 1. To add SWF file to your pages, you also need to add another app widget called “FBML” to your pages at first. There are some steps guiding you how to add the “FBML” widget to your page. Open your page, type “FBML” into the search box and you will see “Static FBML”. Please click the application and you will go to the widget application page. Click “Add to my page” on the top left side of the page to add the “FBML” plugin to your fan page. Below is an example for one of my business pages. You’ll see that you need to make a picture the exact size of your swf flash for clicking on first to activate your flash slide show. After you edit the script code, click “Save changes”. You will see the box on the right side of your fan page. If you do not want the box the right hand side, you can also add it as a tab at the top by clicking the “+” icon. Click the “FBML” tab on your page, you will see a picture at first. Please press the picture and your flash slide shows will load and display. But before you insert or embed the flash file in to your Facebook page, you also need to create a flash slide show and upload files to your website at first with a Flash slideshow Maker, which allows you to make or create Flash intro, dynamic banner or header, animated picture album. 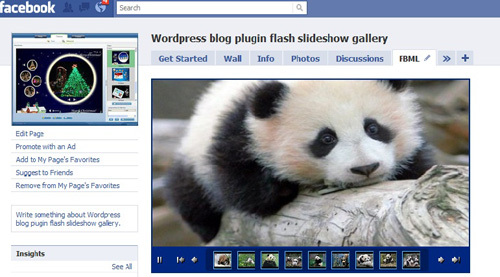 It is easy for you to embed your flash intro, banner or header, dynamic photo gallery into your Facebook business pages.